The Carpenter's Ministry Toolbox: EDUCATION: Great book for the wee ones! It's always hard to find a good resource for young kids, but I've found one! There a lot they can't understand about faith, but they CAN understand the stories and the story of Jesus is the best and most important one to share with them. 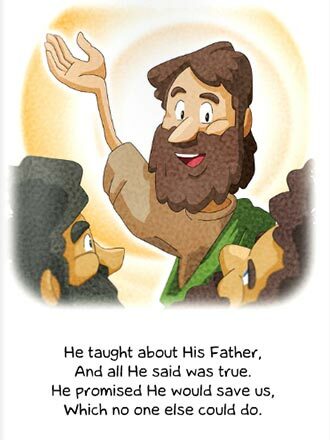 Most rhyming books try so hard to rhyme and be clever that they use vocabulary far beyond that of a 2nd grader, however, the new booklet from the Lutheran Hour Ministries called Do You Know Who Jesus Is? is really good. I just read it and the illustrations are perfect for the age group, the rhyming is simple, and the vocabulary age appropriate. It also does a really nice job of telling a simple story. Just add a song like Jesus Loves Me and a prayer and it's an excellent devotion, Jesus Time class lesson, chapel talk or children's message. Christian School - new students gifts!! Church Pew Bags for kids. Children's Message - Break it into sections or take the time to read the whole thing. New member or visitor gift for a family with young children. Check out the preview and order here.